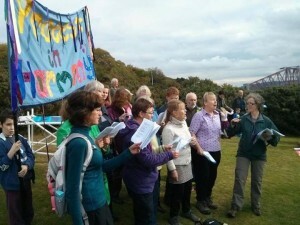 Protest in Har­mo­ny sang with the ‘hun­dreds of peo­ple who joined hands along the Forth Road Bridge yes­ter­day to take a stand against new gas-drilling tac­tics in Scot­land. 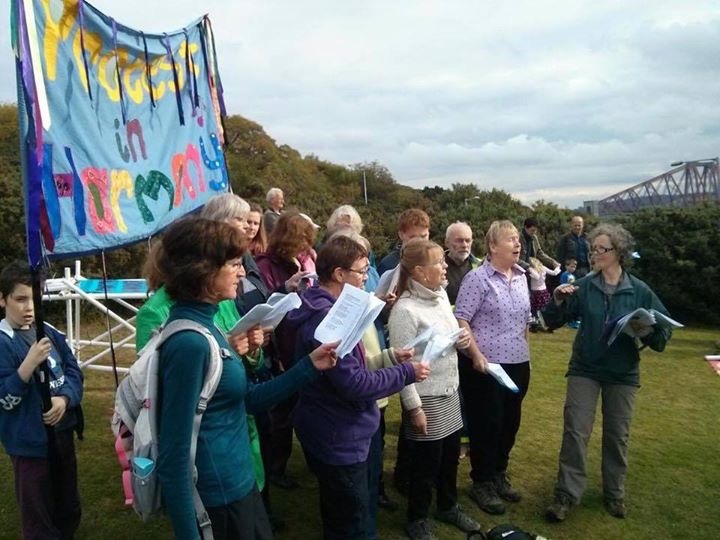 Join­ing hands from one side of the two-and-a-half kilo­me­tre bridge to the oth­er, pro­test­ers from all over Scot­land and fur­ther afield gath­ered to form the human chain, as car horns toot­ed in sup­port and a bag­piper played. Signs with mes­sages such as Don’t Drill Our Land and ‘œDin­nae dae it Nico­la, it’s no worth it,‘ were held aloft at both ends of the bridge, before pro­test­ers braved the winds howl­ing down the riv­er. The protest was held in oppo­si­tion to the prac­tice of Under­ground Coal Gasi­fi­ca­tion (UCG), using chem­i­cals pumped into coal seams to extract gas, that has been pro­posed in the area.